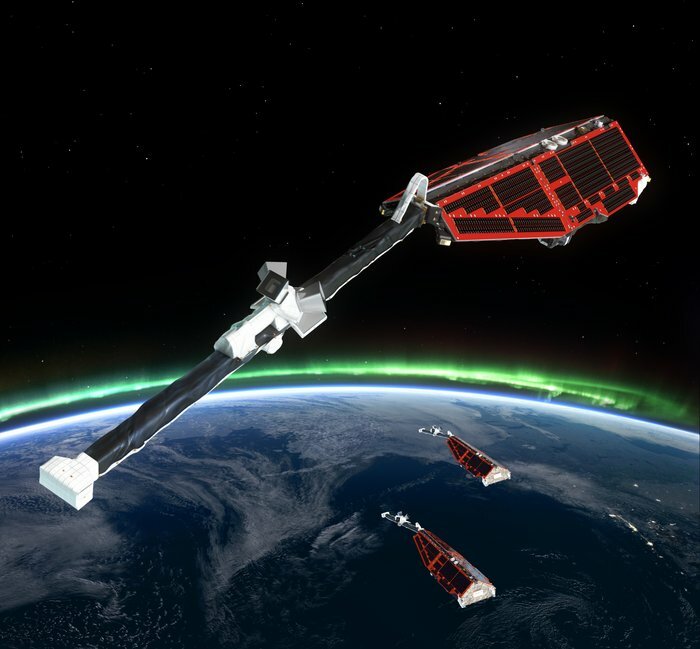 Swarm is ESA’s first constellation of Earth observation satellites designed to measure the magnetic signals from Earth’s core, mantle, crust, oceans, ionosphere and magnetosphere, providing data that will allow scientists to study the complexities of our protective magnetic field. Strong electric currents in the upper atmosphere are known to vary according to the season, but ESA’s Swarm mission has discovered that this seasonal variation is not the same in the north and south polar regions. 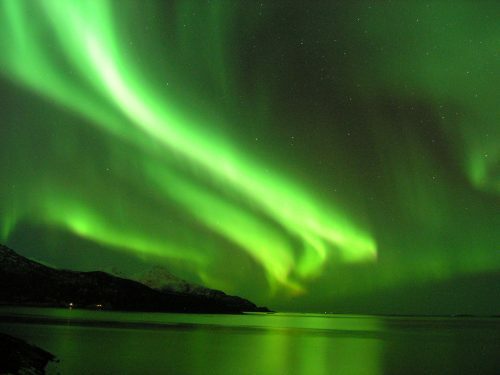 Named after Kristian Birkeland, the scientist a century ago who first postulated that the ‘northern lights’ were linked to electrically charged particles in the solar wind, these currents flow along Earth’s magnetic field lines in the polar regions. 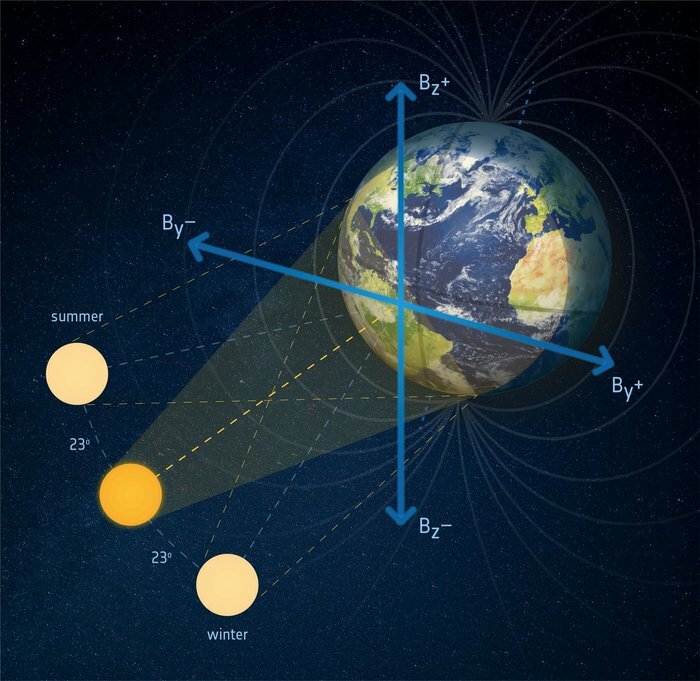 Magnetic field measurements from ESA’s Swarm satellite constellation are allowing scientists to understand more about these powerful currents, which carry up to 1 TW of electric power to the upper atmosphere. This is about 30 times the energy consumed in New York during a heatwave. Three years of measurements from ESA’s Swarm mission have be combined with measurements from Germany’s earlier Champ satellite to produce global climatological maps of Birkeland currents. These currents tend to be weak for a northwards interplanetary field and strong for a southwards field. Importantly, these new results also reveal that the strength of the currents is not the same in both hemispheres. These hemispheric differences may relate to asymmetry in Earth’s main magnetic field. It is important to understand the interplay between these Birkeland currents and the solar wind that bombards our planet and that can potentially cause power and communication blackouts. New findings, presented this week at the Swarm science meeting in Canada, show how three years of measurements from the mission were combined with measurements from Germany’s earlier Champ satellite to produce global climatological maps of these currents. The magnetic field and electric currents in and around Earth generate complex forces that have immeasurable impact on every day life. The field can be thought of as a huge bubble, protecting us from cosmic radiation and charged particles that bombard Earth in solar winds. Moreover, these results show differences between currents in the northern and southern hemisphere, how they change with the season and how they vary according to the strength of the solar wind. 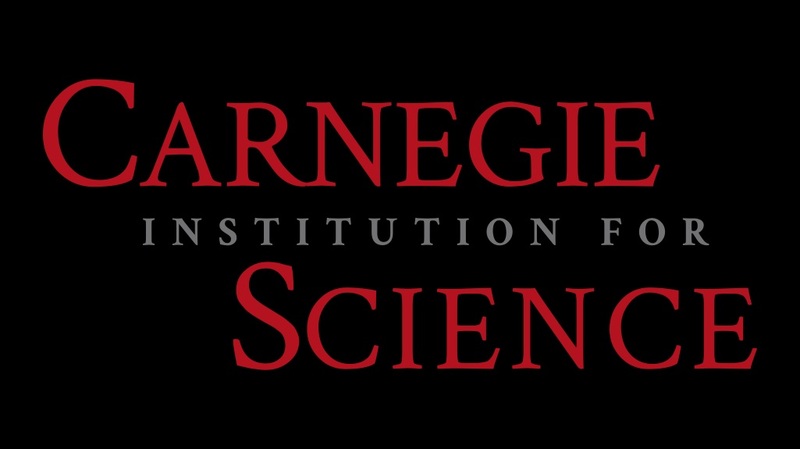 Karl Laundal, from the Birkeland Centre for Space Science, explained, “Interaction between Earth’s magnetic field and the interplanetary magnetic field – meaning part of the Sun’s magnetic field carried by solar wind – depends on how the interplanetary field is orientated. “While this sounds complicated, it means that hardly any solar wind can enter the magnetosphere and arrive at Earth if the interplanetary magnetic field points north, parallel to Earth’s magnetic field. “On the other hand, if the interplanetary field points south, the opposite is true and this allows a connection to be made with Earth’s magnetic field. Birkeland currents therefore tend to be weak for a northwards interplanetary field and strong for a southwards field. Importantly, these new results also reveal that the strength of the currents is not the same in both hemispheres. These hemispheric differences may relate to asymmetry in Earth’s main magnetic field. In fact, the two geomagnetic poles are not geometrically opposite to one another, and the magnetic field intensity is also not the same in the north as in the south. Dr Laundal said, “The main reason for this probably has to do with differences in Earth’s main field. Such differences imply that the ionosphere–magnetosphere coupling is different in the two hemispheres. “In particular, the magnetic pole is more offset with respect to the geographic pole in the south compared to north, which leads to different variations in sunlight in the ‘magnetic hemispheres’. Because of these differences, the two hemispheres do not respond symmetrically to solar wind driving or changing seasons. 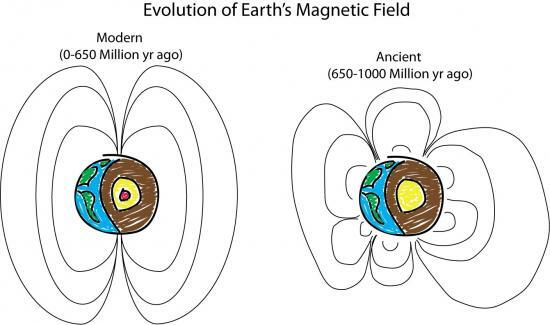 An illustration of ancient Earth’s magnetic field compared to the modern magnetic field, courtesy of Peter Driscoll. An artist’s depiction of Earth’s magnetic field deflecting high-energy protons from the Sun four billion years ago (not to scale).Credit: Michael Osadciw / University of Rochester. Like tiny compasses frozen in time, ancient zircon gems from Western Australia have shown Earth’s magnetic field is at least four billion years old – more than 700 million years older than previous evidence suggested. 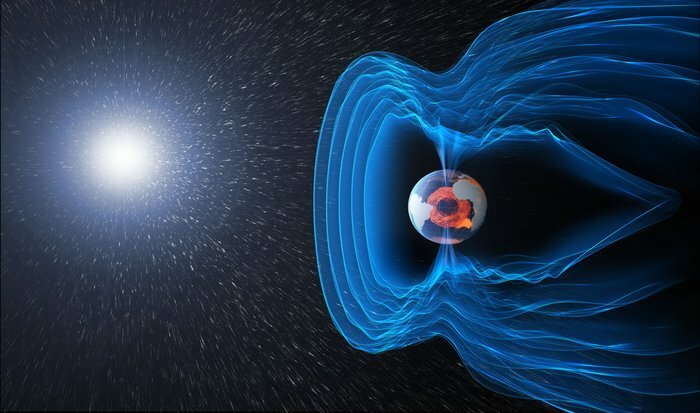 Because the magnetic field protects the Earth’s atmosphere from destructive solar rays, it raises the possibility that life could have made its debut much earlier than previously thought. 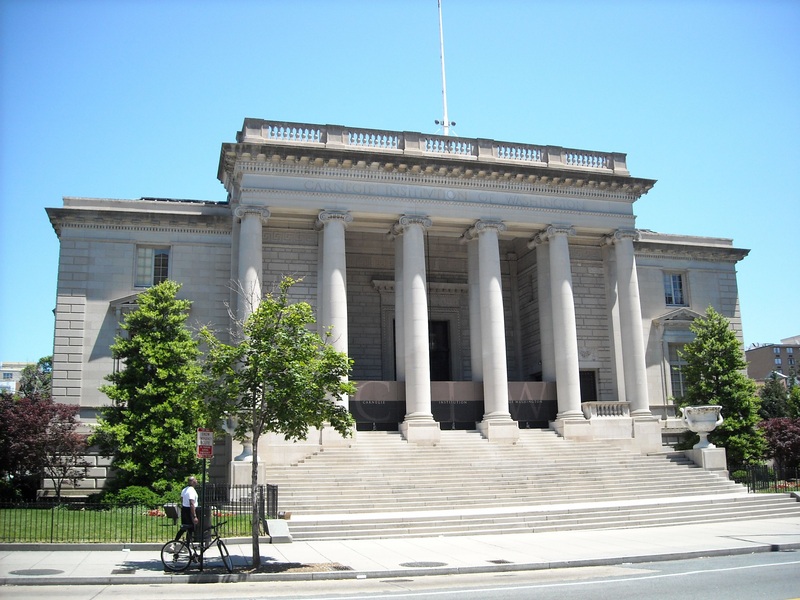 A North American team, led by John Tarduno at New York’s University of Rochester, found the young Earth had a chaotic magnetic field that was, at times, as strong as our field today. They reported their work in Science in July. It’s “astonishing to be able to probe the magnetic field that far back”, says Louis Moresi, a geoscientist at the University of Melbourne. Earth formed some 4.5 billion years ago, accreting from dust and proto-planetary fragments swirling around the Sun. Even in the near absolute zero temperatures of space, enough heat was trapped in the colliding mass to melt material in its core. Over time, the radioactive decay of uranium and other ‘hot’ elements has kept the core molten. Today, if you were to drill through the crust, you’d travel through 2,900 kilometres of rocky mantle before reaching the outer core. You’d then slither through 2,200 kilometres of liquid iron, before hitting a metallic inner core about 1,200 kilometres in diameter – a little smaller than the Moon. 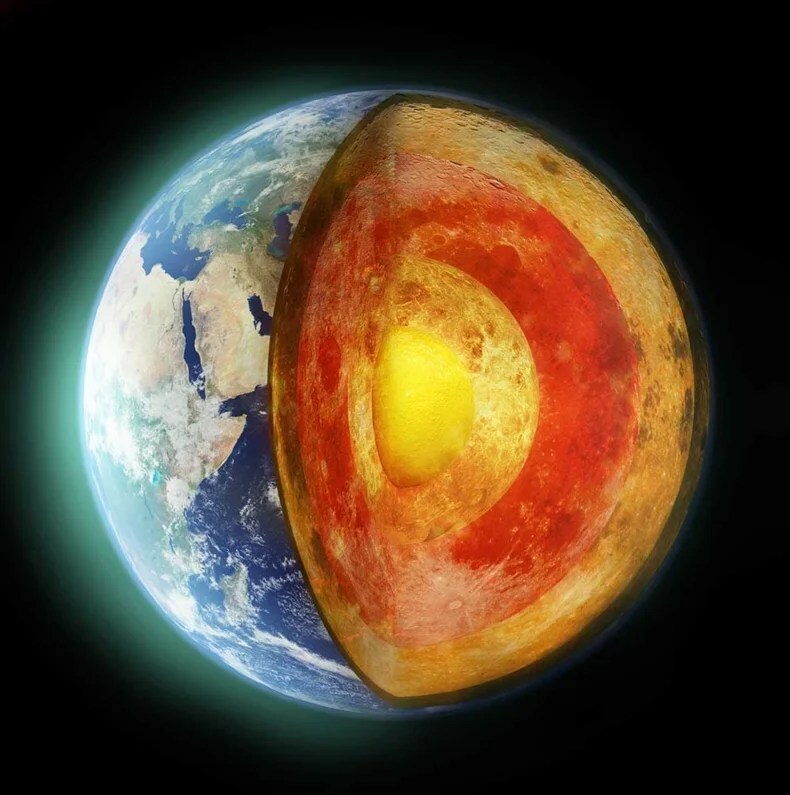 The inner core is kept solid by the enormous pressures at the centre of the Earth. It’s the liquid outer core, constantly stirred by convection currents, that generates our magnetic field. Just as hot air rises, hot iron rises towards Earth’s cooler surface, carrying heat that escapes through the mantle and crust. As the iron cools, it sinks, providing a constant stirring motion that generates our magnetic field. The mantle layer is vital to maintaining this motion. If it is too thin, the heat in the core dissipates quickly, along with the magnetic field. If it is too insulating, the vital convection currents shut down. Thanks to the Earth’s daily rotation and the stabilising solid inner core, the convection currents in the molten outer core have settled into spiralling columns that lie parallel to the Earth’s axis, giving us the elegant north-south dipole our compasses use today. What was it like in the Earth’s youth? It’s hard to say. 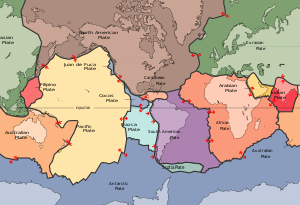 Our dynamic planet’s surface is continually crushed, stretched and recycled – thanks to plate tectonics – and rock remnants from the Earth’s earliest days are scarce. But thanks to a zircon crystal dug out of 4.4-billion-year-old sandstone on a Western Australian sheep ranch, we may have a clue. The University of Wisconsin-Madison-led study last year claimed the gemstone was born 100 million years after the Earth itself. For Tarduno and his team, that report raised an exciting possibility. They realised that like mosquitoes in amber, tiny iron oxide grains also known as magnetite would be trapped inside the zircon as it solidified and could have recorded the ancient magnetic field. His team returned to the same area and collected 25 zircon crystals dated from 3.3 to 4.2 billion years old, and examined them for microscopic magnetite flakes. But a super-sensitive instrument was needed to pick out the magnetic alignment in the grains. 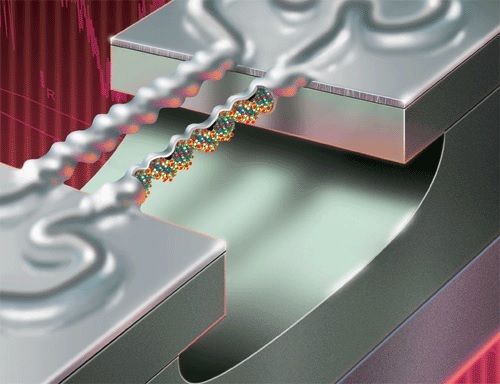 Enter the superconducting quantum interference device (the SQUID). This ultra-high-definition magnetometer can detect faint magnetic fields – as much as 100 billion times weaker than the energy needed to move a compass needle. The SQUID found the magnetite grains harboured magnetic fields of varying strengths – from the equivalent of today’s magnetic field, to 12% of its strength. Before this study, the oldest evidence for a magnetic field on Earth came from South African rocks dated at 3.2 and 3.45 billion years old. Two of the oldest zircons in Tarduno’s study were 750 million years older. 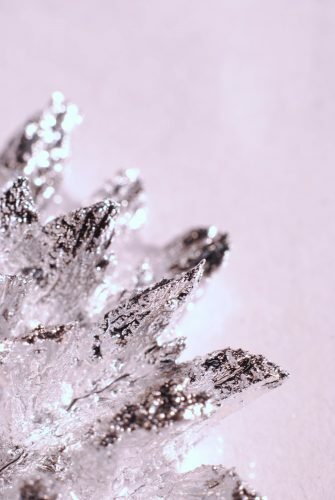 “It’s amazing what they could get out of these little guys,” Moresi says, adding they really are “miracle crystals”. So why does the age of the magnetic field affect life’s appearance on Earth? Basically, the field shields us from our life-giver – the Sun. Streams of charged particles flow from the Sun, bombarding the inner planets and stripping away their water and atmosphere – unless a magnetic field is strong enough to deflect the onslaught. Tarduno points to our neighbour, Mars. The barren world once had a magnetic field, but no longer – nor any surface liquid water or atmosphere to speak of. Scientists think that around four billion years ago the Earth and Mars were battered by asteroids. On Mars, the onslaught over-heated its mantle. As the heat gradient between the core and mantle was lost, its core’s convection currents slowed and eventually stopped, switching off its magnetic shield and allowing the solar wind to whisk its atmosphere away. “It may also be a major reason why Mars was unable to sustain life,” he says. But the Earth was a little larger, and able to weather the storm. Ensconced in its protective magnetic bubble, life could begin to flourish.